"Although more and more consumers are flocking to tablets as their secondary computing device of choice, netbooks still have some advantages. In the case of the Toshiba mini NB505, the biggest edge is its low price. For $299, Toshiba's low-cost alternative to its dual-core, aluminum-clad NB305 features plenty of battery life and a stylish EasyGrip finish that protects your investment. Not bad for a Windows 7 machine that costs $200 less than the cheapest iPad." Despite the trend toward tablets, a few manufacturers are still producing new generations of netbooks, Toshiba amongst them. A lower cost, single core system, starting at $299, it offers Toshiba quality, a decent but plasticky keyboard, long battery life (over seven hours), and, costs $200 less than the cheapest iPad. At 2.6-pounds, it offers a quality LCD, but (only) 1024x600 resolution, stays cool on the lap, and has plenty of ports available. 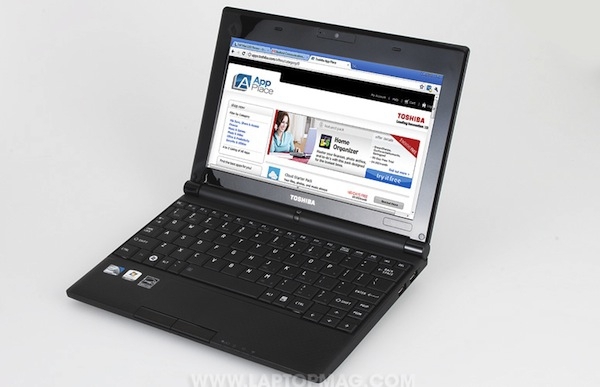 Performance is only adequate, as are graphics, but again, this is a $299 netbook. Laptop's overall opinion: for the price, the NB505 delivers style and substance. The NB505 is currently available on Amazon for $298.